Welcome to my cartoon blog. I love cartoons and have a particular fondness for Disney animation. I also run the Cartoon Academy, a series of workshops designed to teach the wonderfully expressive art of cartoon and animation to people of all ages and abilities. The daughter of legendary Disney animator Glen Keane (and successful Disney artist in her own right) has produced a wonderfully illustrated book for children. An interesting podcast featuring former Disney artist Jin Kim. Jin explains his career to date and describes his time at Disney. I’m a huge fan of Disney’s Big Hero 6 and of course a huge fan of the supervising character designer on the feature, Jin Kim. 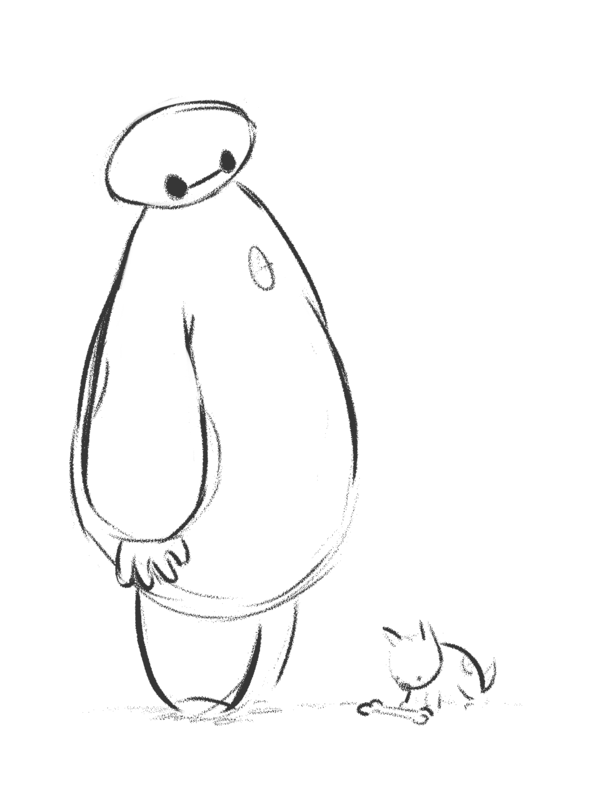 I took a couple of pencils and had a quick bash at rendering Baymax in a few scenarios. 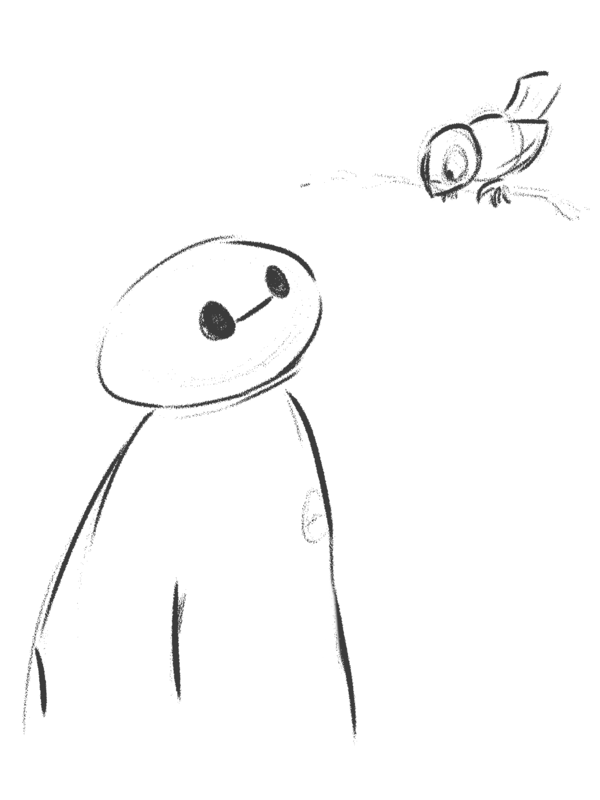 Baymax is a wonderful character to learn to draw as he’s just a few basic shapes. It’s incredible just how much expression can be placed into Baymax with just a few simple strokes. Jin Kim’s creation of Moana is wonderful. The film itself is a wonderful film and captivated my daughter and me throughout. I heartily recommend taking the children along to see it. It’s perhaps a little intense in places for the younger ones but most children will fall in love with Moana and her adventure. So I created a quick sketch of the young warrior based on a bit of a mashup of artwork that I found on Pinterest. I’ll shortly create a video to illustrate how to recreate this sketch. The beauty of Milt Kahl’s expression is evident here in these wonderfully sketched images of Penny from The Rescuers. 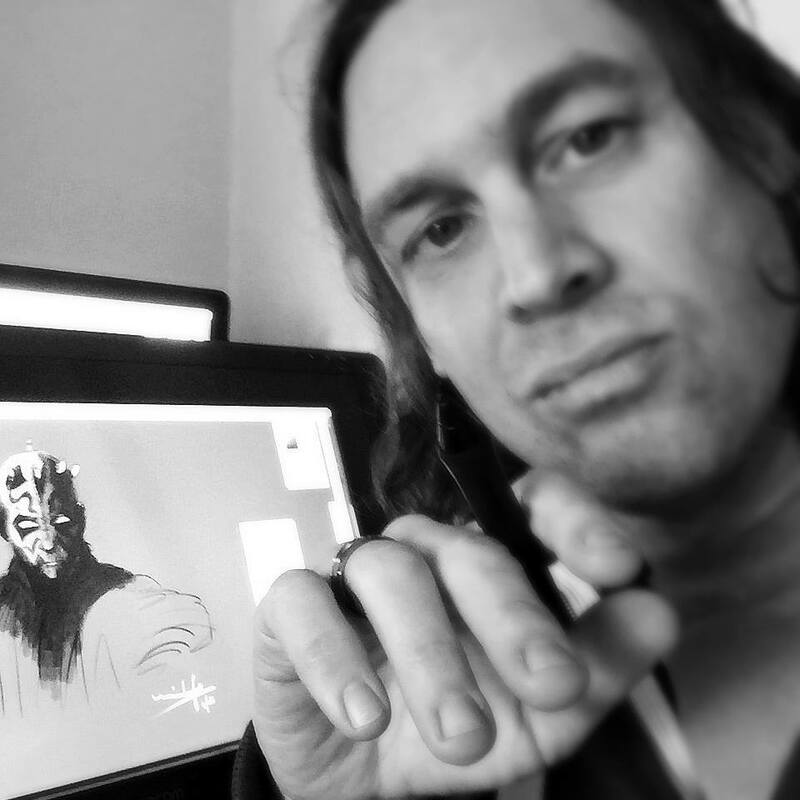 I’m always trying to encourage sketching with my young students who always seem preoccupied with ‘perfect’ lines. These sketches were produced by Milt Kahl as he worked alongside Ollie Johnston in crafting the character. What I love about these sketches is just how rough they are. You can see a denser line around the girl’s head and form. But in the eyes and expression the lines are light and simple. There is so much to learn here, not least the importance of a free flowing pencil with no regard for perfecting or cleaning the lines. Read the full blog article here. So here is my first blog post. How exciting! Right off the bat I want to share my favourite working artist, the remarkably talented Jin Kim. Jin is a South Korean artist working as a character designer at Disney Animation. His back catalogue of work is remarkable and you can see his influence throughout all of Disney’s most popular features from the last 10 years or so. Such a wonderfully expressive artist. I’ve watched videos of Jin at work and he’s a fan of Photoshop for his digital sketching. I suspect the images above were created using Photoshop on a large Wacom Cintiq. Check out his work at his Tumblr blog Cosmo Animato.